* Please note: This set is part of my larger unit "Snowmen at Work"
As teachers we’re constantly asking our students questions before/during/after reading and encouraging them to summarize stories in their own words. 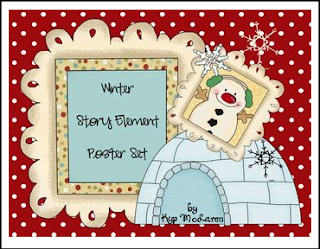 So, to help with “retelling” I’ve included some “Wintery or Snowy” retelling anchor chart posters to use with your children. Run off a few copies, laminate and leave them in the reading center for them to use after you’ve read a story to them or they’ve read with a friend. By putting the posters in the reading center students can practice retelling different stories after reading to self/someone. You could also hang up the retelling pieces so they could use the visuals as they continue practice retelling skills.